comScore (October 2011): 184 million US Internet users watched an average of 21.1 hours per viewer and engaged in 42.6 billion video views. A record 20 Billion Content Videos Viewed on Google Sites! NielsenWire (November 16, 2011): the amount of time spent streaming videos online is growing at a much faster rate than the number of video viewers. eMarketer (November 28, 2011): forecasts the number of the number of US tablet users will reach 89.5 million in 2014 and by 2015 there will be 148.6 million smartphone users, stoking demand for mobile online video. Mashable (November 14, 2011): 71% of US Internet users visit video sharing sites on a typical day. Unbounce (October 31, 2011): reports that using video on a marketing landing page lifted conversion rates by 100%. Futuresource Consulting: forecasts consumption of legitimate free and paid for online video is on track to exceed 770 billion views across the USA, UK, France and Germany this year. Given the above statistics, it stands to reason that including videos in your blog posts is an additionally important way to help people not only find your blog posts, but engage with them as well. Noted social media consultant Chris Brogan encourages using video in blog posts, and he can’t be wrong, can he? Notably, in a September 1, 2011 Entrepreneur.com article, Chris also shared several helpful strategies you can use to start video blogging. But not all videos are created equal. Rather I should say that not all videos are equally easy to include in your blog posts — specifically your WordPress.com blog posts. However, for certain topics, as in the case of my recent blog post, (I’ve Had) The Time(line) of My Life, I wanted to include a video that was only available on Facebook. Doing so wasn’t nearly as intuitive or easy. Eventually, after several minutes of serious searching online, I found a website with a solution that worked: How to Add,Show or embed facebook video on your wordpress, joomla, blogger blog or website. 1.) Locate the URL of the Facebook page in which the source video is embedded. The URL for the video from the (I’ve Had) The Time(line) of My Life post (pictured below) is https://www.facebook.com/photo.php?v=980256227111. 2.) identify the number after the “v=” — in the case of the previously mentioned video, the number is 980256227111. And there you have it — you have successfully embedded a Facebook video into your WordPress.com blog! Michael Shermer — Founding Publisher of Skeptic magazine, Executive Director of the Skeptics Society, and columnist for Scientific American — examines the reasons “why people believe strange things” in his February 2006 TED Talk (presented below). You can also watch it on the TED website and follow along with an interactive transcript). In his speech he addresses questions such as “Why do people see the Virgin Mary on cheese sandwiches” or “Why do people hear demonic lyrics in ‘Stairway to Heaven’?” It is for many of the reasons above that people look for logic — or at least deeper meaning — in places where there might really be none. Consider the many other fears explained in the ABC News article, “Fear of Friday, the 13th (Paraskevidekatriaphobia) and Other Unpronounceable Phobias.” Often people invent explanations for things they don’t understand (or don’t want to confront). Just think about how the world functioned before the emergence of science! For example, the current irrational obsession with all of the instances of “316” that presumably occurred when Tim Tebow lead the Denver Broncos to a playoff victory over the Pittsburgh Steelers last weekend. When it comes to Tim Tebow, many well-meaning and honestly inspired individuals nevertheless connect dots that don’t necessarily make sense connecting and draw conclusions that are entirely based on assumptions and anecdotal evidence. “Tebowmania” seemed to hit a crescendo following the hysteria when what appeared to be a “halo” formed over Mile High Stadium in Denver last Sunday after the team’s playoff win. Photo Credit: “Friday the 13th” by Dennis Skley. Update: Despite the above exploration into the absurdity of superstition, I wore my “lucky” Wes Welker jersey when my favorite NFL team, the New England Patriots, hosted the Denver Broncos for the AFC Divisional Game on Saturday, January 14, 2012 and they won! The following week, on Sunday, January 22, they beat the Baltimore Ravens in dramatic fashion at the AFC Championship Game, sending the Patriots to Super Bowl XLVI — while, again, I wore my “lucky” Welker jersey. Unfortunately, the Patriots faced and — in an almost exact replay to Super Bowl XLII — lost, yet again, to the New York Giants on Sunday, February 5, 2012. And, in true ironic form, one of the many reasons the Patriots lost was because Welker dropped a badly thrown pass from Tom Brady — negating the Patriots attempt at a very possible come back win. How’s that for luck and superstition? I admire Welker, but clearly I will need to wear a new jersey next year! Are you grateful for the gifts you received this holiday season? Hopefully, if you wanted an iPhone 4S (affiliate link) and didn’t get it (or got something you didn’t want), you were not devastated like these horribly ungrateful individuals. For more humorous commentary, consider comedian Jim Gaffigan’s thoughts on getting unwanted gifts. If you did receive a gift for which you are not grateful, remember that somebody always wants — or at the very least could use — what you have. Also consider that, during the “holiday season,” consumers bravely endured pepper spray on Black Friday, delivery drama for items ordered online, travel trauma, and the frenzy of family feuds. Why? To purchase the “perfect” gift for you (just as you might have done for others). Interestingly, despite the many challenges with which consumers were presented, in addition to the overall economic uncertainty, shoppers came out in force this past holiday season. Impressively, despite the odds against it happening, consumers collectively spent nearly one-half trillion dollars buying goods and services that, were it not for the holidays that necessitated the purchases, those items would have most likely never been purchased. And now, with the holidays fading into the past, everyone is turning their attention to their soon-to-be-forgotten New Year’s resolutions. Act as wings that lift you through tough times. Similarly, Chris Brogan encourages people to “forego the idea of a resolution, and instead, to come up with 3 words that will help you define your goals and experiences for the coming year” with his “My Three Words” meme. My Sons: My boys, Jacob and Max, are my inspiration and motivation. Whenever I am with them, my heart fills with joy and my life is filled with meaning. Both have overcome — and continue to work through — unique obstacles, but they do so with grace and gumption. Their presence fills me with pride, love, and laughter. My Friends: I have a small core of friends — maybe 5 really strong connections, mostly from my undergraduate years at UCSB, but one or two from more recent years. While small in number they have provided me with unconditional support that has made a large impact. My Career: Henry David Thoreau is quoted as saying ‘Most men lead lives of quiet desperation and go to the grave with the song still in them.’ I interpret this to mean that most people spend their lives pursuing practicality while foregoing their passion. While both are important, I am grateful to have transitioned into teaching, a career that is both challenging and rewarding. Those are my three gratitudes…what are yours? 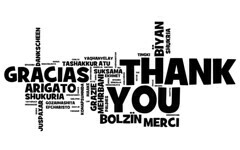 Photo Credit: “thank you note for every language” by woodleywonderworks.